The new WTC bids were published yesterday. A city selection committee will begin negotiating Friday with five developers vying to take over the vacant former World Trade Center office tower at the foot of Canal Street and turn it into a mixed-use hotel and residential complex. The committee will have to decide which of the plans — submitted in response to a request for proposals and all of which propose some combination of hotel and residences — would provide the best value to the city. The five respondents will make formal presentations to the selection committee on Feb. 27. The last time we went through this process, all of New Orleans got into a fight over whether it was best to tear the building down and whether or not the redevelopment should involve the construction of an "iconic structure" whatever that is.... possibly a giant napkin ring, according to some drawings. Anyway, none of it mattered since the winners in that long process couldn't agree with the city on the actual value of the building so the mayor just declared a do-over. And here we are now with five new proposals for a "99 year lease" on the property. None of them propose an "iconic structure" or giant ferris wheel but each has its own hook, so to speak. 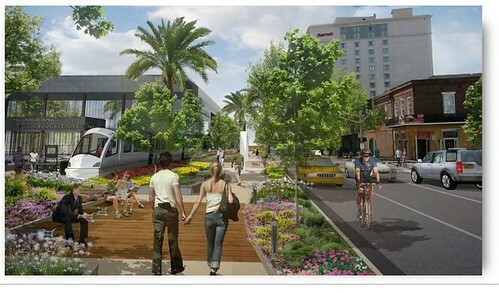 The Four Seasons proposal includes a "cultural attraction." The Hotel Alessandra proposes a "wine laboratory" as well as a ... something.. featuring Kermit Ruffins who was involved with one of the proposals last time around. If I'm reading between the lines correctly, though, this looks like a decision that will come down to either Pres Kabacoff's HRI proposal or Daryl Berger's Conrad Hotel group. Each of those proposals involves actors in the failed "Tricentennial Consortium" bid which the mayor clearly favored last time around. An interactive visitor attraction called the New Orleans Experience and operated by Mercedes-Benz Superdome manager SMG would occupy the building’s 31st floor. An interactive visitor attraction called "The New Orleans Experience" that isn't the actual city of New Orleans even though it is located directly inside of it sounds very Dizneylandrieu-ish to me. Let's go read more about that. NOLA.com published the actual bids proposals. This is from HRI's. Integral to our philosophy will be a world-class, innovative, and inter-active visitor attraction on the 31st floor that celebrates New Orleans' cultural history. This attraction, aimed at local residents as well as visitors, will rival the impact that Manhattan's famous New York Experience did for the Big Apple serving as a memorable, entertaining, intellectual gateway to New Orleans. We're teaming up with Unified Field, the nationally renown inter-active design firm based in New York who helped make the World War II Museum here so exciting, to ensure that this experience is a "must-see" When completed we expect the New Orleans Experience to host 500,000 visitors annually. Yes, it could have been better proofread. The New York Experience, by the way, was a film that ran from 1973 until the late 80s in New York until the rent got too damn high to support it anymore. I guess you could say it was "iconic" in its own right. Although it did have its critics. Something tells me we don't have to worry about Pres Kabacoff's hotel producing a film with that sort of visitor-unfriendly realism involved. Here is a look at the trailer, in fact. While HRI involves SMG and Pres Kabacoff Conrad has all the other important people involved. 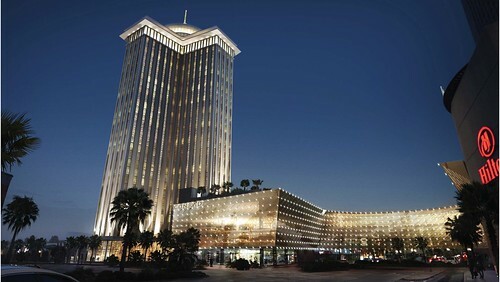 The proposal also contemplates the larger redevelopment of nearby riverfront property, including connecting both the Morial Convention Center and the former WTC building to the Hilton New Orleans Riverside hotel, connecting the Outlet Collection at Riverwalk to Convention Center Boulevard and making “significant aesthetic and practical enhancement” to Poydras Street. The development partnership behind the plan is led by local developers Joe Jaeger, Darryl Berger and Roger Ogden plus Xavier University President Norman Francis. Because they propose to connect the Convention Center via the "Whale Lot" on Convention Center Boulevard, I figured Conrad was most likely to feature a monorail in their proposal. The defunct "Tricentennial Consortium" had a similar idea and featured one in their renderings. The Convention Center has already proposed a package of street redesigns which could accommodate these plans as well. Also, I think Kabacoff owns the Whale Lot. So even if Conrad wins, then, so does HRI. Conrad does have one sorta-iconic thing in mind. The design element will incorporate state-of-the art lighting and kinetic digital effects to bring drama, life and a unified sense of identity to a space that has been sorely lacking same since its creation. In addition to integrated LED lights for animated content, there will be opportunities for projected video art similar to that experienced last year during LUNA fete last year where video images were projected onto the facade of Gallier Hall. The Krewe of Endymion previewed this "Video Wall" feature for us last Saturday. Anyway if you care to wager on this round, I'd put my money on Conrad. Every one of these "lease" agreements has various kickbacks built in, of course, but Conrad takes it that one extra step. On top of that, the 2 Canal team is promising to donate $1 million to Xavier University and $250,000 to the mayor’s NOLA for Life Initiative. So is Berger worse than Kabacoff? Can anyone be worse than Kabacoff when it comes to the local working stiffs folks that he'd like to get rid of?